16"/17"/18" front wheel FITMENT: 1984-2012 FXST / FLST models (EXCLUDES: FXSTD and Springers) and custom applications. These bad boys are just screaming for fresh paint and painters love Klock Werks sheetmetal - one coat of fill primer and they are ready to paint (which saves YOU money at the paint shop!). The Klock Werks Benchmark Front Fender gets rid of those ugly rivets and big fender mount brackets. The tail of the fender is extending 1 1/2" for a dropped and slammed look and better matches the stock fender and perfectly matches our Softail Rear versions. The fender rides tighter to the tire with adequate clearance and yet minimizes that stock Dirt Bike level that the factory bikes are famous for. E-coated for minimal bodywork and easy painting, all holes are laser cut so it takes the guesswork out of getting the right clearances and getting it on straight. 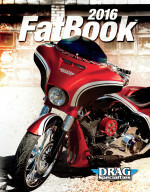 * The Benchmark fenders can be paired with the Klock Werks Softail rear fenders to complete the Klock Werks Kustom look. * Fender features an extended 1 1/2" rear tail. * May also be used in a variety of custom applications. * No mounting blocks required.